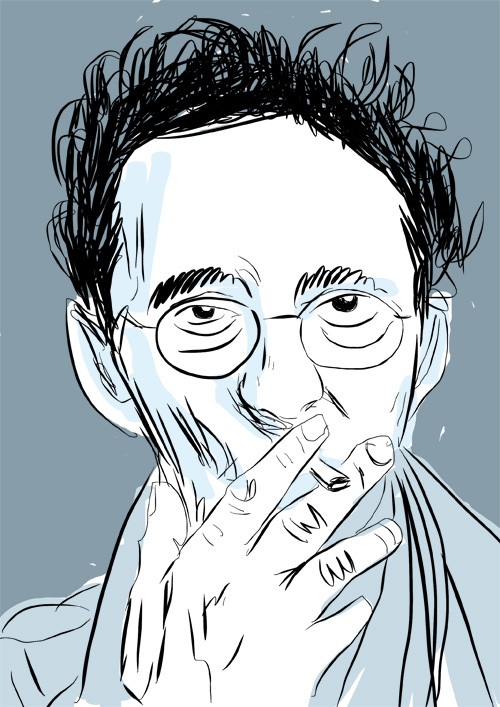 Once again The Balde magazine is out, and this time I did a portrait of Roberto Bolaño. I did quite a lot of test on a diferent photograph. Ma! zenbat denbora ezer idatzi gabe, ea ba pare bat gauza igotzen ditudan. Hementxe azken The Balden argitaratutako Roberto Bolañoren erretratua, eta lehenago egindako froga batzuk. Ok, as if looks like I lately only draw when The Balde is coming out, here another of them, jeje. A portrait of Miguel Noguera. Again working on a photo, but vector stuff this time. At thebalde.net the pages layout (you’ll need flash). Uhm… beno, ea erritmoa hartzen diodan berriro eta azken boladan gertatutakoen berri igotzen dudan, bolada honetan marrazki gutxi eta bideo afera dexente… joanen naiz igotzen. Hasteko marrazki bat, dirudienez The Balde da azken boladan marrazteko arrazoi bakarra… baina ez da hala, ez pentsa jeje. Hementxe azken zenbakian ateratako Migule Nogueraren erretratua. with the faces of Bide Ertzean music band. Bide Ertzeanekoen nolabaiteko erretratuak egin nituen azkeneko The Baldean. Beno, katarroek pixkat “out” uzten zaituzte eta ez dago gogo handirik posteatzen ibiltzeko, baina bueltan naiz. The Baldeko beste zenbaki bat kaleratu da jada, eta bertan Harkaitz Canoren erretratu bat egin dut, beno, edo bi. The Balde 62 is on the streets and online. 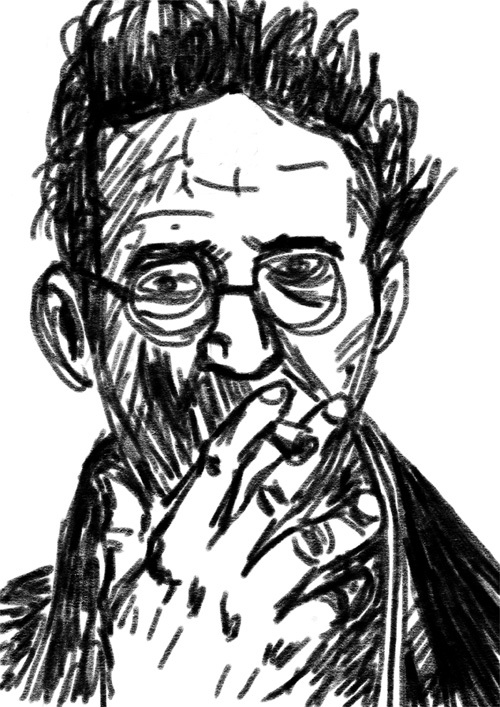 This time I did a portrait of the basque writer Harkaitz Cano, or better said a couple of version of a portrait, or so. Esan beharra daukat erabilitako Photoshopeko pintzelakin maitemindua nagoela, oso trazo naturala sortzen du bai marraren puntetan zein hertzeetan, ez da somatzen ohi den errepikapen afera hori. Jeisteko lotura uzten dizuet. I fall in love with this photoshop brush, the result is so natural for me, no pattern like repetitions ond edges or ends of the trace. There you have it. And below and skecht it came out in the process, it doesn’t really look like the portrayed one and I wanted something more concrete for this time. 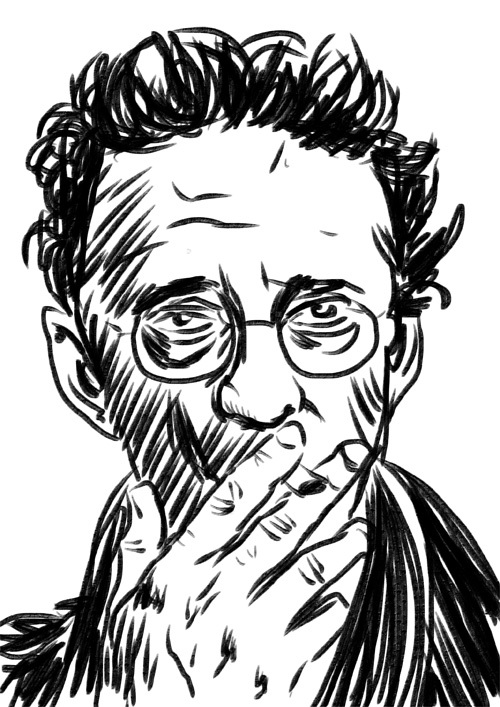 Anyway it is an interesting way of using this brush playing with the pressure hard way. The Balde magazine is out on the streets and inside of it this Talib Kweli portrait. 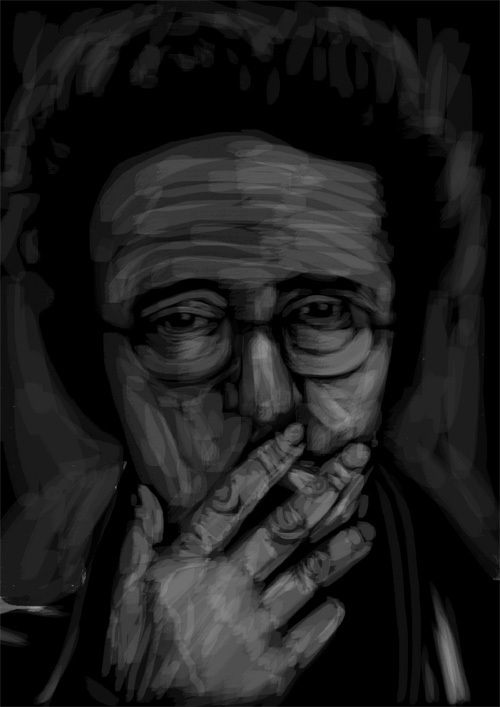 to upload this portrait I did for the balde. y os dejo este retratro para the balde. Me encanta el trinomio foto del sujeto+photoshop+wacom.